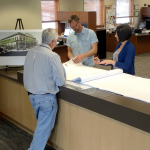 Our staff is very happy to help you with Property Development, Economic Development, Code Enforcement, Mapping, and other issues involving making Lynden a more desirable place to live for everyone. Our office is also the point of contact for most local environmental issues. We are a small department that has the ability to give friendly, prompt, and professional service to everyone. All Planning and Community Development Department downloadable forms and applications can be found HERE. All forms and applications for the City of Lynden can be found HERE.